Organizing Priorities guides the financial advisor to define the vision and arrange the priorities within the Business Plan that require a highlighted focus on a daily, monthly, or annual basis. 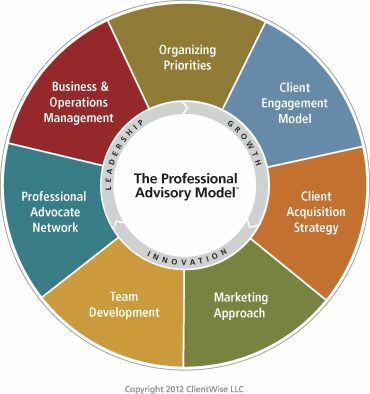 Client Engagement Model™ involves all interactions between the advisor, the advisor’s firm and the client. Client Acquisition Strategy™ is the strategy, approach, tactics and execution of acquiring and on-boarding new clients. Marketing Approach is the disciplined planning and strategy that precedes the tactical aspects of client acquisition (i.e. building a marketing plan and budget, identifying target markets, implementing technology and CRM, developing a clear and concise message, creating marketing materials, etc.). Team Development is all of the activities and behaviors necessary for the growth and maintenance of a high-performing team. Professional Advocate Network™ is the collection of trusted advisors who work together in a mutually-defined relationship for the benefit of the client, where business professionals provide high-quality introductions to other members of the outlined network. Business & Operations Management is an all-inclusive category that absorbs much of the necessary and practical aspects of running a profitable and sustainable business, including P&L responsibilities, compliance and workflow processes. Leadership has applications towards all other categories and can pertain to: leadership of clients, team leadership, or leadership within the community. Innovation, like Leadership and Focus on Growth, transcends all groupings and accentuates the continual need for creativity and re-invention. Growth is an overarching theme that can apply to all segments of the model and emphasizes the need for the advisor to be future-oriented and alert to all growth opportunities within the business.